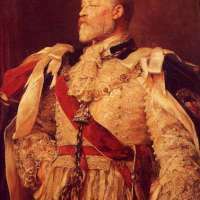 Edward VII (Albert Edward; 9 Nov 1841 - 06 May 1910 ) was King of the United Kingdom of Great Britain and Ireland, King of the Commonwealth Realms, and the Emperor of India. He reigned from 22 Jan 1901 until his death on 06 May 1910. When Queen Victoria died on 22 January 1901, the Prince of Wales became king. Then 59, he was the second oldest man to ascend to the throne in British history (the oldest having been William IV), who ascended at age of 64 years. Edward(born 1841) was the eldest son of Queen Victoria and Prince Albert. Since the reign of Victoria queen/empress was the longest, Edward was the heir and the Prince of Wales for the longest period of time. He ascended to the throne at the turn of the century and his reign, lasting for about a decade, came to be known as the Edwardian era. In 1863 Edward got married to the daughter of King Kristian IX of Denmark, Alexandra. He became father to six children over the course of time including George V.
Edward had an above average appetite and he ate about five meals a day, consisting of about 10 courses each. As he became middle aged he had a waist of 48 inches. He was also known for his philandering ways and had six mistresses. In 1860 he became the first British royal to tour the US, and upon return he got involved in a scandal with an Irish actress. 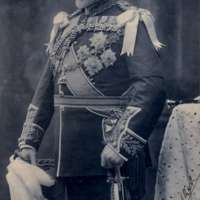 A speaker of English, French, Spanish and German, Edward was touring many countries when he was the heir and upon ascension to the throne, he tried to play the role of the peacemaker, especially with France, but was unable to stop the outbreak of the First World War. In the end his profligate ways proved to be his undoing. He was known to smoke 20 cigars daily and it is no surprise that he contracted severe case of bronchitis while in France. The time was one of political tension and he had to come back to England and tend to his matters. He breathed his last on 6 May 1910. 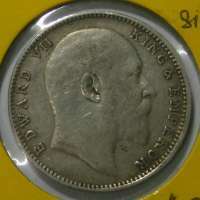 The Edward VII series of coins of India are dated from 1903 to 1910. 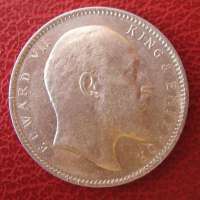 No Gold coins were issued during the reign of Edward VII. There are four silver coins (1 Rupee, 1/2 Rupee, 1/4 Rupee and 2 Annas) and three copper coins (1/4 Anna, 1/2 Pice and 1/12 Anna). A cupro-nickel 1 Anna coin was introduced in 1906. Coinage of Queen Victoria had the Queen's bust facing left, following the British practice of making the effigies of successive sovereigns face opposite directions,the coins of Edward showed the king facing right. On 1 August 1906, the copper coins were replaced by bronze issues with the same obverse and reverse designs but a thinner plancet due to the rising international prices of copper. The 1906 coins come in both varieties. Another special feature of the coinage of this period was that, in all the silver coins the inscription was in both English and Persian, compared to Victoria coins that showed only English. In 1 anna cupro-nickel coin, the value was shown in five languages - English, Persian, Hindi, Bengali and Telugu. There were over 263 million of these Indian 1 Rupee coins featuring King Edward VII (1901-10) minted in Bombay and Calcutta. Finding the mint mark on Edwardian silver is tricky. There is no mint mark for Calcutta. 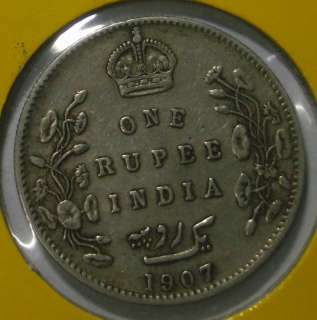 The Bombay issues have a small incuse "B" (the 1903 Rupee also has a raised "B" variety). 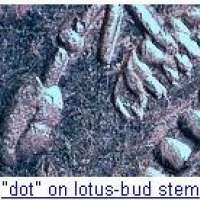 The "B" mint mark can be impossible to see but a "dot" on the stem of the lotus-bud (lower right on reverse) is a more prominent mark. Coins struck at Bombay show an incuse B under the cross in the lower part of the crown on the reverse. The incuse B is sometimes quite difficult to see even on uncirculated coins and sometimes all one can see are two raised dots representing the centres of the loops of the B. 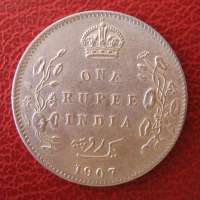 The Indian rupees 1862-1938 were 11.66 grams, .917 silver, .3438 of an ounce of silver. One rupee coins 1907 one coins also two coins 1947 one ruppe sale pries please buyer mumbai no sent sir.